ROANOKE, VA (March 21, 2018) — Member One FCU recently donated $1,000 to Miriam’s House to support its mission of providing stable housing to women and children who have experienced homelessness. “As a community-focused credit union, we love to connect our employees with opportunities to make a difference, but it’s their compassion and generosity that makes the true impact on the organizations and lives we serve in our community,” said Jessica Clarkson, Vice President, Market Relationship Manager with Member One. Miriam’s House has been helping women and families overcome homelessness for 24 years in the Lynchburg area. Its comprehensive programs provide solutions to the myriad of issues associated with becoming homeless such as limited employment opportunities, victimization, poor health and nutrition, and childhood trauma. 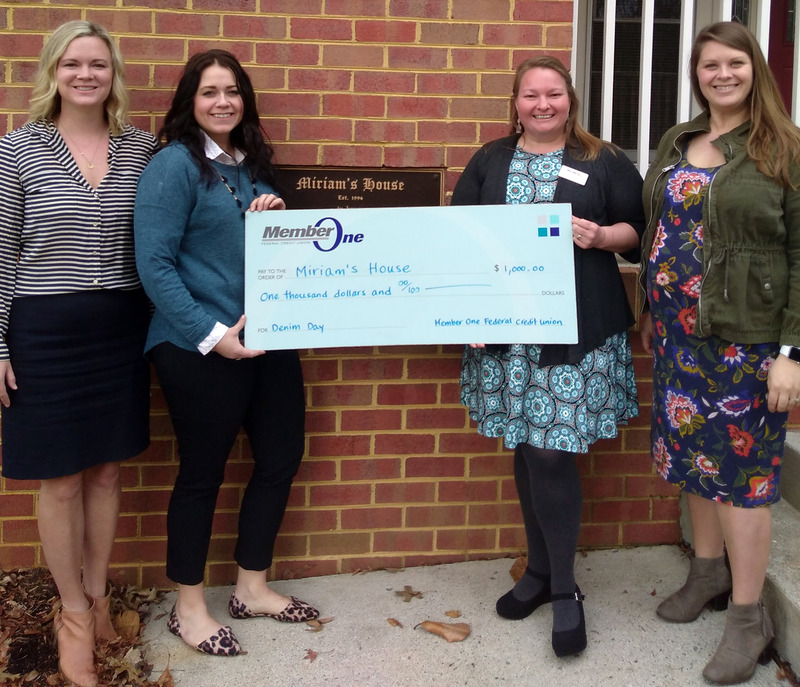 “Miriam’s House is committed to ending homelessness in Central Virginia and this generous donation by the employees at Member One FCU makes us one step closer to reaching this goal,” said Sarah Quarantotto, Executive Director of Miriam’s House. Member One believes that strengthening the local community is everyone’s responsibility and therefore has a concentrated focus on supporting the communities it serves through financial and volunteer support. For more information about Member One and its financial products and services, visit www.memberonefcu.com.